Some bands' names are as much an indicator of their chosen sound as a 30-second preview of their record. 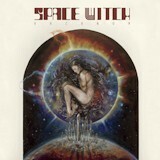 Such a band is Space Witch, which has been around for ten years, playing a trippy stoner doom that owes as much to Hawkwind as it does to Sleep. Arcanum continues this sound with a progressive vibe to it. Starting gradually, the riffs come lazily in like sleepy whales drifting on the tide, to the background of a thin, whining keyboard that evokes a sci-fi atmosphere. Even if the riffs didn't change tempo through the entirety of the first 15-minute track, it would still be a pretty good song, but partway through, the tempos speed up and the keyboards sharply go up and down like a siren as the bridge goes on red alert to the sound of wordless choruses. Electronic oohs and ahhs from the keyboard are all the listener gets of vocals on the first track. The other tracks have some vocals, though not singing; more of a chant. Astro Genocide's consists of maniacal-sounding recitation of what sounds like a philosophical text (I wasn't familiar with it), while Hex Solaris sounds a little like early Cathedral in its lack of melody, but is cleaner and shouted rather than sneered. It's also got a nice keyboard/bass break that is followed by a sharper, rougher guitar sound without the heavy riffing that normally comes with it. The final track is returns to a slower and more menacing sound, with the keyboard assuming an ominous tone around the monolithic riffs used; when the tempo does increase, the sense of foreboding, brought about by judicious use of minor keys, increases. For those who like long, atmospheric doom songs but perhaps want something a little better defined than Sleep and its followers, Arcanum is a good middle ground.